Outlift Concentrate By Nutrex at SameDaySupplements.com® for lowest price. What Is Nutrex Outlift Concentrate? OUTLIFT CONCENTRATE is packed into just a small 6.2g serving size, this fully disclosed formula, “just short of rocket fuel” will launch you into the next level! In 2014, Nutrex Research decided to take a stance with its release of OUTLIFT, a full clinically dosed pre-workout which stood as a polar opposite in comparison to concentrated pre-workout formulas. Subsequently, OUTLIFT AMPED was released for those looking for clinically dosed ingredients while still seeking extreme levels of stimulant energy. Today, we look to offer a concentrate worthy of the OUTLIFT name, one that offers a true fully dosed performance enhancer, utilizing NO3-T Nitrate technology, all while harnessing extreme levels of energy that will deliver the most intense training sessions. All this at an affordable price and flavors you have come to love and expect. 1.5 Grams of Choline Bitartrate: Studies suggest Choline Bitartrate is an essential nutrient that increases Acetylcholine levels, mental energy and cognitive processing, while also supporting athletic strength and performance. Acetylcholine supports healthy muscular contractile force which is very important during intense training. 750MG of N-Acetyl-L-Tyrosine: Research has shown that this amino acid supports increased motivation, mental focus and alertness. It is known as a mood enhancer, increases energy during exercise and simply allows you to be at your peak performance. 500MG of Sodium Nitrate (as NO3-T): Sodium nitrate is the result of combining the nitric acid with a sodium base, such as sodium hydroxide, sodium carbonate, or sodium bicarbonate. Sodium is a well-known mineral and electrolyte in the body that helps support hydration levels and muscular contraction. Sodium Nitrate is approximately 73% nitrate, which means in a 1g dose of sodium nitrate you’re consuming 730mg nitrate and 270mg sodium, quite the hefty dose of nitrates for such a potent compound! 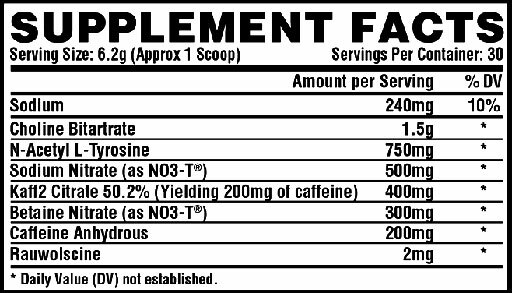 400MG Kaff2 CITRATE 50.2% (ACTIVE) 200MG CAFFEINE ANHYDROUS: Caffeine is one of the most well-researched performance enhancement ingredients. OUTLIFT CONCENTRATE includes two active caffeine sources, Kaff2 Citrate and Caffeine Anhydrous. Caffeine Citrate is the ideal stimulant for those looking to increase energy as quickly possible because it appears to raise caffeine blood levels faster than other caffeine sources. Supplementing with caffeine immediately increases work volume and muscle strength, mental alertness and mood, assists in fat loss and helps you train at a higher intensity level. 300MG Betaine Nitrate (as NO3-T): Betaine nitrate is a combination of betaine anhydrous and nitric acid. Betaine (trimethylglycine) is found in beetroot (just like nitrates) and is also a metabolite of choline. Those familiar with Nutrex Outlift Stim-Free have witnessed the power of this potent ergogenic first hand. In the body, betaine operates as a methyl donor, which helps eliminate harmful compounds like homocysteine or create S-adenosylmethionine, a compound which enhances creatine production. Similar to creatine, betaine also functions as an osmolyte supporting cellular hydration levels. Betaine has been proven in numerous studies to enhance power and strength in resistance-trained athletes in exercises such as the bench press, vertical jump and isometric squat force. 2MG Rauwolscine: Rauwolscine is an alpha-receptor antagonist that can block the action of receptors responsible for stopping fat breakdown. Consuming before you train allows your body to keep breaking down fat beyond the point in exercise where it would normally stop which in turn helps to promote longer lasting energy, endurance and stamina. Outlift Concentrate is available in three delicious flavors: Blackberry Lemonade, Miami Vice, and Sour Shox. What's In Nutrex Outlift Concentrate? How Do I Take Nutrex Outlift Concentrate? Shake container before each use. Mix 1 scoop of Outlift Concentrate into 8-10 oz of cold water and drink 30-45 minutes prior to working out. Use only 1 serving (1 scoop) in a 24 hour period. Never take more than 1 scoop. Not to be used by anyone under the age of 18. Do not use if pregnant or nursing. Never exceed the recommended maximum dosage. Do not consume synephrine, yohimbe, caffeine, thyroid boosting compounds from other sources, including but not limited to coffee, tea, soda, energy drinks and other dietary supplements or medications containing phenylephrine, caffeine, or any stimulants whatsoever. This product contains caffeine. Do not use product for longer than 4 weeks and make sure that usage is followed by a 2-week off-period. Consult your physician prior to use if you are taking any medication, including but not limited to MAO inhibitors, anti-depressants, aspirin, non-steroidal anti-inflammatory drugs or products containing phenylephrine, ephedrine, pseudoephedrine, phenylethylamine or other stimulants. Consult your physician prior to use if you have a medical condition, including but not limited to heart, liver, kidney or thyroid disease, psychiatric disorders, difficulty urinating, diabetes, high blood pressure, pernicious anemia, cardiac arrhythmia, hyper beta-alaninemia, recurrent headaches, enlarged prostate or glaucoma. Discontinue use 2 weeks prior to surgery. Immediately discontinue if you experience rapid heartbeat, dizziness, severe headaches or shortness of breath. This product contains ingredients that may be banned by some sports organizations. As individuals vary so may results from using this product. Store out of sunlight in a cool, dry place. Do not use if outer safety seal is broken. KEEP OUT OF REACH OF CHILDREN. Store in a cool, dry place (60°F to 80°F). We have a large selection of in-stock Nutrex products including Pre Workout items and others for the lowest prices at SameDaySupplements.com® It's always easy to shop for Outlift Concentrate By Nutrex at SameDaySupplements.com® because you can browse by reviews, brand, prices or search for specific ingredients using our search tool. In-stock orders placed before 3pm EST ship out the same day to USA, Brazil, United Kingdom, Canada, Germany, Australia, Japan, India, France and worldwide at the cheapest prices online.